Minister of Telecommunications, Science, Technology and Industry, and area representative, Dr. Jerrol Thompson, spoke of the transport challenges of students from his constituency and said the bus would be a âsignificant benefitâ and comfort to them and their parents. Dr. Thompson, said to be the driving force behind introduction of the school bus, recounted reports of teenaged girls riding unacceptably on trucks, children missing classes and mini-vans refusing to carry school children in favour of a higher adult fare. 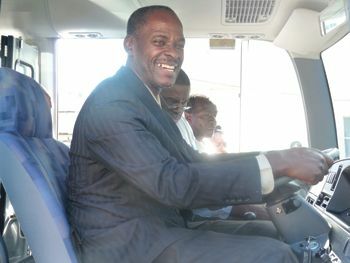 He said the delivery of the bus was also necessitated by the increased number of students travelling from the area as a result of the Unity Labour Party administrationâs âEducation Revolutionâ which seeks to provide every Vincentian child with access to secondary education. According to Clayton Burgin, Minister of Transport and Works, the scheme has produced a 61 per cent increase in secondary school attendance among 11 to 12 year olds since the current administration took office. While it is believed over 100 school children travel from the North Leeward area into the capital each day, the new bus will seat 40 persons per journey. As such, Kenneth Abraham, who is set the task of supervising school buses in the area, ensuring that they arrive at scheduled routes in a timely manner, urged parents to be patient, as efforts continue to help resolve the transportation problems in rural areas. The brand new Nissan, registration number G752, will serve all villages in the North Leeward area, starting from 6:30 each morning, arriving in Kingstown at 8am. Students returning home after school will be able to board the bus at the Little Tokyo Bus Terminal at 4 pm. During the day, it will be used for other functions as needed by the Ministry of Education. While exact fees have not yet been determined, they are expected to follow established practice of a 50 per cent discount on normal journey fare. According to Dr. Thompson, it took almost 7 months to source the bus from Japan and implement all the provisions necessary to make it ready for use and urged students to âtreat the bus as their ownâ. He hoped the bus would still be in excellent condition five years from now.